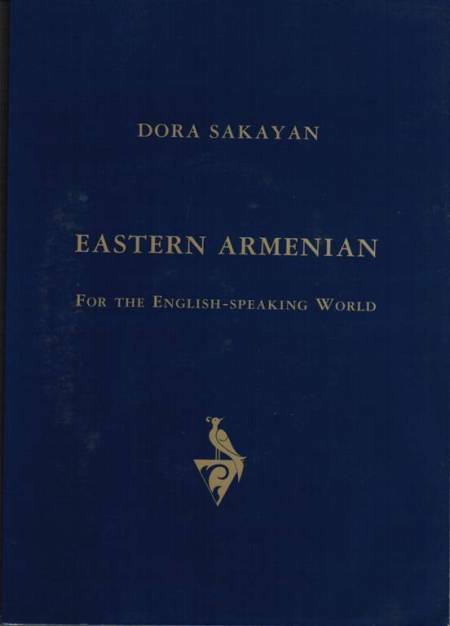 Eastern Armenian for the English-speaking World is a textbook that aims at teaching Eastern Armenian, the official language of the Republic of Armenia, to adult beginners. Though the manual is not written specifically with students of Armenian descent in mind, its importance for the younger generations of Diaspora Armenians cannot be stressed enough. It allows them to improve their own linguistic skills and discover the language of their homeland, especially if parents and friends have spoken Western Armenian. Sakayan has succeeded in incorporating a vast amount of linguistic material into a single textbook by distributing that material methodically among the twelve proportionally structured units. Each of these units deals with a special topic and usually consists of twelve sections of its own in which linguistic phenomena at various levels are discussed in a consistent order. All units start with a dialogue that is followed by an easy-to-understand narrative text. After the dialogues come sections of thematically organized vocabulary, pertinent grammatical explanations, pronunciation, calligraphy, orthography and word formation. Though each unit includes a specific section on Armenian-English contrasts, the similarities and differences between the two languages are continuously indicated and,whenever possible, principles of contrastive linguistics are invoked to provide explanations. Reading and writing skills are progressively developed through a special Romanization method that makes the Armenian script easy to master. Another groundbreaking feature of this textbook is the accompanying CD produced by the author for self-study. Since the texts are read by native speakers of Eastern Armenian, this CD will prove indispensable for mastering pronunciation.